Lace is fascinating, for it is not only beautiful but useful in a variety of ways. It serves, as the examples will show, as table covering, Christmas tree ornaments, articles of apparel, complements for flower bouquets and protectors of the wood finish (!) of furniture, to name only a few of its uses. 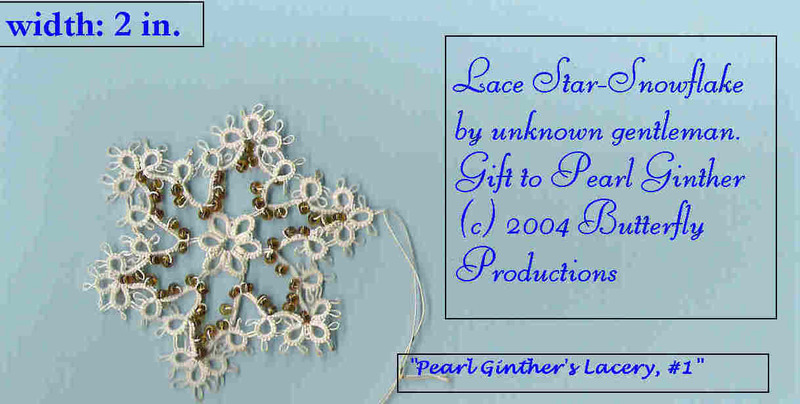 Enjoy this sampler, taken from Pearl Ginther's collection of more than fifty laces or examples of lace (one is from her book collection). Complements of Ethel Waters, the great film, stage, and singing star who signed the 1972-published book, "To Me It's Wonderful," Pearl Ginther owns, her wrap of lace worn at a Billy Graham evangelistic meeting. PLEASE RETURN FOR MORE PARTS OF "PEARL'S LACERY," AS THEY COME ON-LINE! AND WE ASK YOU TO SIGN OUR GUESTBOOK IF YOU WILL TAKE A MOMENT, FOUND ON THE PLAINVIEWFARM HOME PAGE.